Last year we did a great feature on a fantastic mom of four busy boys, Sarah Dees. Sarah is the busy Mom that loves to share fun and frugal activities and crafts with fellow moms on her blog frugalfun4boys.com. Well this month we want to share one of her incredibly easy and interesting crafts that any boy will love. 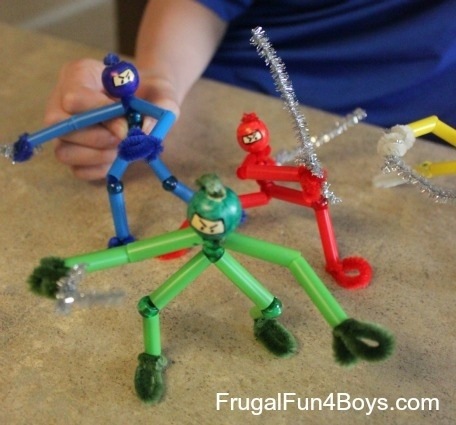 Pipe Cleaner Ninjas are the perfect craft for boys. Not only can they manipulate them into any shape they want they can also use their creativity to design them in any color they want. Let them practice their ninja skills all day long as they create bodacious bendy bodies. 1. Twist 3 pipe cleaners together, make sure that you go around a couple of times so that they are indeed twisted together completely. 2. Take 3 pony beads and place them on the legs twisted together. 4. Twist the extra pipe cleaner into hands and feet. For the hands, try to make one loop for the “hand” and a smaller loop for a thumb. Next wrap the excess around the wrist to help keep the straws from sliding off. For the feet, form one loop and then wrap the excess around the ankle. 5. Next use the wooden beads and the sharpie markers and create ninja faces. Them slide the beads over the neck pipe cleaner. To secure the head try twisting the end into a knot and trim off the excess, you may want to put a dab of glue at the end to keep the knot tight. Now enjoy your pipe cleaner ninjas! Kee-ya! This entry was posted in Activities and tagged Activities, crafts, Frugalfun4boys.com, fun, the boys store on September 24, 2013 by Lacy.